NOTE: Our new version 2 works on all current Windows versions. If you need version 1 for an earlier version of Windows please contact us. Shown above, is a shot of the main screen for the DarkRoom Wizard v2 showing the screen layout and controls. Look for the DarkRoom Wizard at your local Photo Retailer, Industrial Photo Supply, Technical Bookstore or Software store. You can also order it here on the website. The DarkRoom Wizard is now in use worldwide with users in: USA, Canada, UK, Australia, Japan, Greece, and Germany. 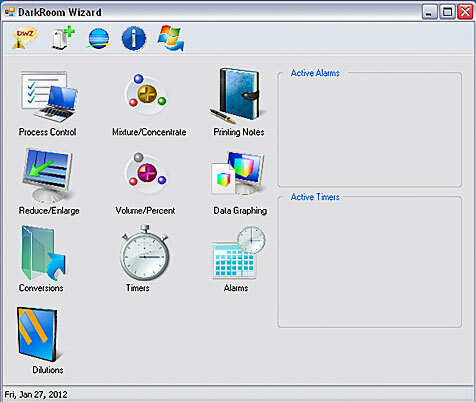 DarkRoom Wizard is now available as a "ShareWare" product. If you install it and find it useful, we hope that you will see fit to honor us with a Donation toward software maintenance and futher development..
Click here for a review from CameraArts Magazine. Click here for a review from Shutterbug Magazine.